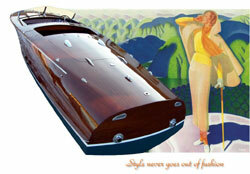 Inspired by the exuberant sport boats of an era where style and panache defined your lifestyle. 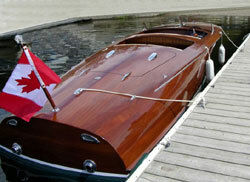 Clarion boats is pleased to present our latest design, the RA 23 Barrelback. 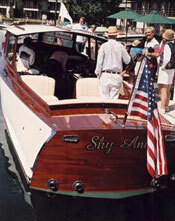 The warmth and beauty of gleaming mahogany, sumptuous leather and sparkling chrome are combined with modern building techniques and power trains to offer carefree boating in a manner to which you will become accustomed. Built without compromise, the Clarion RA 23 has enduring quality that makes it tomorrow's classic today. Powered by a Mercruiser 350 Horizon, 300 hp, the RA 23 delivers exciting performance that will broaden your smile. A hand crafted Gentleman's Racer. Mahogany, leather, chrome and horsepower are combined in a visually dramatic package that gives full meaning to the word "Awesome". Designed in the spirit of the recreational racers of the 1930's and 40's, The GR 21 delivers excitement on the water or at the dock. 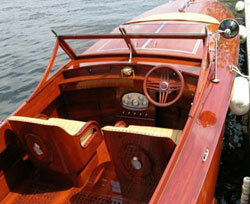 The Clarion Gold Cup 19 Speedster is reminiscent of the Sport Boats of the 1930's that were used occasionally for recreational racing. We offer three variations of the GC 19 Speedster. They are available with or without the optional forward cockpit. Power options range from 300 to 400 hp allowing you to choose your own level of excitement. 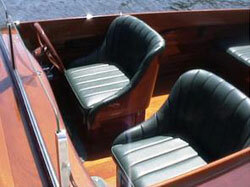 The detailing, deck layout and planking scheme can be personalized to reflect your individual boating style. Appointed with handmade steering wheel, supple leather upholstery and hardware designed to suit each specific model, the GC 19 Speedsters surpass the commonplace. The Gold Cup 225 Sportster shares the exuberance and excitement of it's big cousin the Gold Cup 25 GR but is delivered in a smaller package. The uncompromising quality of construction and attention to detail combined with breathtaking design set this boat far above the ordinary. With acceleration that puts you back in your seat and handling like it?s on rails, The GC 225 has the ability to raise the heartbeat on demand. 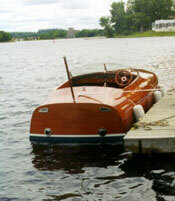 With rounded sheer and fluid lines, this boat appears to be going at speed while still at the dock. Built in the "West System" using premium materials, select Honduras Mahogany, and exotic hardwood accents the GC 225 Sportster has the look of fine furniture yet has the rugged durability of a monocoque structure. 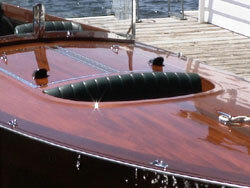 Clarion built boats are not subject to the problems inherent in traditionally built wooden boats. 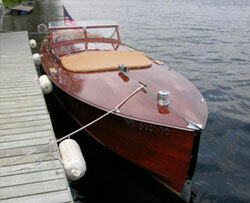 The Clarion Fast Launch 25 SD captures the spirit and essence of the exquisite long deck launches that graced the waters of Muskoka in the 1920's and 30's. from the waterline up the styling is pure tradition, but below the waterline the running surface is designed to accommodate today's power and deliver stability and performance that is not normally expected from this type of boat. The generous main cockpit affords roominess and comfort for family outings or for entertaining guests. The seating is upholstered in your choice of luxurious leathers. Available is an optional "mother in laws" cockpit in the fore deck for additional seating or for an exciting ride. 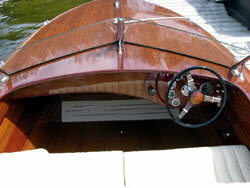 Details like molded wooden seats, handmade steering wheel and custom hardware set this boat far above the ordinary. With power options from 300 to 425 horse power, performance is lively and spirited. 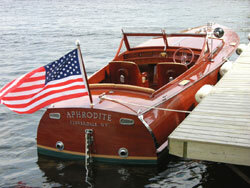 This model can be configured with a raised deck (RD) or customized to suit your personal boating style. The Clarion Fast Launch 29 RD is designed by Steve Killing to reflect the stately presence and character of the famous Ditchburn Vikings. With refined lines, a running surface suited to today's power applications, modern building technique and warranties in place, the Clarion FL 29 RD affords trouble free boating in a style to which you will become accustomed. Sumptuous leather upholstery, custom made chrome plated bronze hardware, exotic wood inlays and subtle details create a craft that is not only inspired but inspiring. 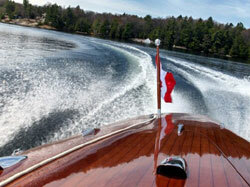 Powered with an 8.1 liter, 425 hp Mercruiser HO performance is exhilarating and beyond most expectations. The Clarion Fast Launch 34 HT was conceived and designed to embody the grace and refined elegance of an era when style had substance. 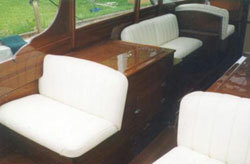 With amenities like a luxurious leather and mahogany interior, a refreshment center, capacity to entertain 10 and six foot standing headroom under the hardtop, the Fast Launch 34 has the enduring qualities of a timeless classic that will be appreciated not only today but for generations to come. On the water or at the dock this boat has a presence that speaks volumes in a whisper. Beneath the garb of an elegant lady lies the anatomy of a spirited athlete. 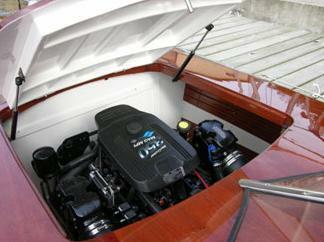 Powered by two 300 hp Mercruiser V-8's She is capable of startling performance. The FL 34 HT is thoroughly modern in all but appearance. 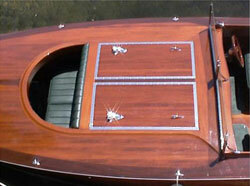 For strength, durability and minimum maintenance this boat is built using the "West System". 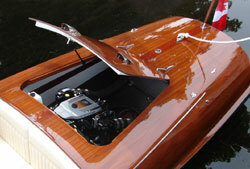 Clarion Boats are fitted with custom hardware and the finest components available. By varying cockpit arrangements, interior appointments, and choosing color schemes the Fast Launch 34 HT can be configured to suit her owners individual boating style.